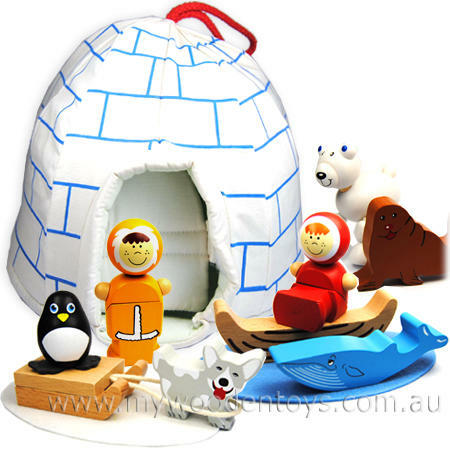 Inuit Igloo Wooden Playset is an unusual and beautiful playset complete with a self standing cotton igloo. This set comes with two Inuit characters in painted wooden coats. They can sit or stand up with the twist of their bodies. The igloo is made of material, has a base, opening door and stands by itself. All the pieces included in this set fit inside the igloo and can be carried around by the string loop on its top. Also included are a sled and dog, whale, penguin, walrus and a very friendly looking Polar bear with bendy legs. Size: Igloo is 22cm x 22cm x 22cm Characters are 90cm high. We like this because: "Such a unique playset. "